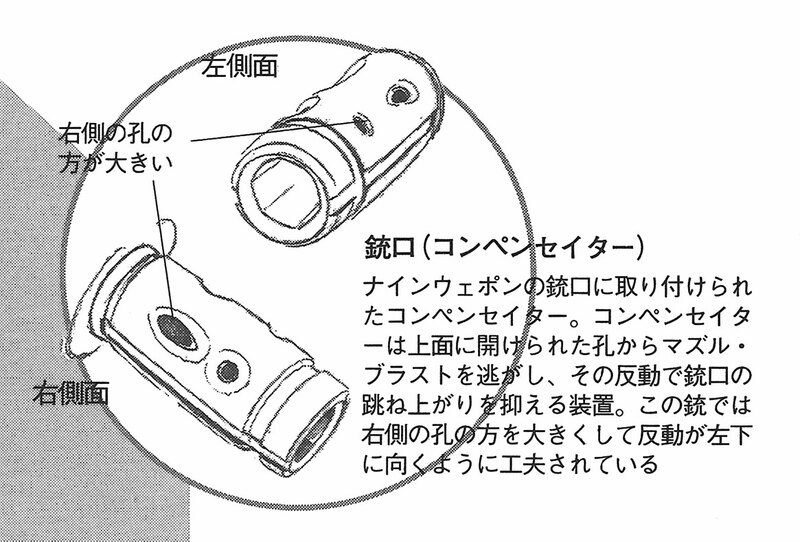 The weapons in “Ghost in the Shell” are shown as items to help illustrate the 2029 setting. As such, although they loosely follow projections based on current technology, they’re not strictly bound to them – instead being designed based on what will look good in a movie context. For example, the guns are generally made of metal rather than plastics, and that’s one place where you can see the director and the rest of the staff (although if we’re honest, mostly the director) impressing their own ideas upon the designs. However, on the other hand, it could be that there has been progress in numerically-controlled 3-dimensional metal milling technology and improvements in alloy technology, and what we’re seeing in these weapons is the effect of those improvements and such predictable trends as greater precision in gunsmithing, coupled with lower costs. In that sense, it would be a mistake to say that the weaponry shown in “Ghost in the Shell” is always futuristic. This is something that both Mamoru Oshii (director) and Noutomi-san (weaponry concept design) have touched upon in their comments. However, first and foremost, is the desire to design something futuristic the best way to achieve a futuristic design? This is something that many films and works in other genres have failed in. In fact, it woudn’t be far off to say that the concept of “a futuristic design” stopped having real meaning back in the 50s. We believe the movie that really demonstrated that once and for all was “Blade Runner.” But despite all that, since we’ve never actually tried our hand at purely “futuristic designs,” we’ll have to put this down as an open question with no definite answer yet. Standard cartridge for the Zastava Nosle M22. 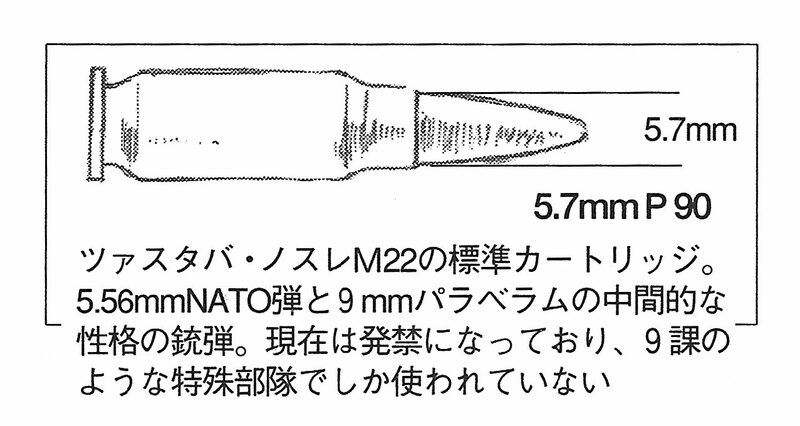 Functionally, this round is a midpoint between 5.56mm NATO and 9mm Parabellum. It is currently banned, and is used only by special forces units such as Section 9. Ed: elsewhere, the 9-weapon is stated to use the FN P90’s 5.7×28mm cartridge. This is the compensator fitted to the 9-Weapon muzzle. Compensators have openings on their upper surface in order to direct the muzzle blast upwards, the push-back from which prevents the gun jumping up too much when firing. On this gun, the right side openings are larger, an innovation which provides push-back to the left and down. “Assault rifles,” which constitute the mainstay of man-portable military weaponry, can be said to have been introduced as rifles with an added full-auto firing feature. The problem is that rifle ammunition is relatively high-powered, so simply full-auto firing the same ammunition destroys any hope of maintaining consistently high accuracy. (In fact, several full-auto, man-portable weapons were produced that used rifle ammunition, but they all turned out to be pretty useless to all but the most heavily-built operators). As such, the powder load was reduced, and the stock type changed to a straight stock (rifles up until this point employed a downward-curving stock to allow recoil to dissipate upwards). That is the assault rifle we know. The lower-powered rounds of the assault rifle, then, gave it slightly less range and stopping power than its rifle forebears, but at the time, infantry was already beginning the march towards mechanisation, and pure range was no longer particularly emphasised. More importantly, the requisite battlefield movement speed had risen to an incomparable level, and this “man-portable firearm” was suddenly burdened with the essential need to be capable of area suppression in order to be considered effective at all. Meanwhile, submachine guns (SMGs) also emerged, also as man-portable full-auto firearms. Despite significantly lacking in range and stopping power, they were praised for the simplicity of using existing handgun ammunition, and were effectively put to use in urban warfare and anti-crime roles, where larger ammunition would not be needed in combat in enclosed spaces. However, the increased severity of urban crime and the greater power of firearms in the hands of criminals meant that situations where the SMG was insufficient were on the rise. To meet the new need, various companies developed weapons that would act as a midpoint between assault rifle and SMG. The 9-Weapon is one of those.